Ulster winger Robert Baloucoune has been banned for two weeks for for his tackle on Munster's Darren Sweetnam in last week's game at Kingspan Stadium. The 21-year old was shown a yellow card by referee Sean Gallagher at the time for the incident, which occurred after only 11 seconds of the game. Baloucoune went on to score a try after returning to the field as Ulster ran out 19-12 victors before being cited for the challenge. The panel, comprising of Robert Milligan QC (Chair), Sheriff Kathrine Mackie and Jennifer Rae , deemed the offence to have been worthy of a red card and imposed the suspension. The player will miss tomorrow's game against Connacht and next week's trip to Leinster. The panel concluded that the player had committed an act of foul play in terms of Law 9.17 – A player must not tackle, charge, pull, push or grasp an opponent whose feet are off the ground. In upholding the Citing Complaint the Disciplinary Committee deemed that the offence merited a low end-range entry point of four weeks. However, noting Baloucoune’s previously clean disciplinary record, his admission that his actions warranted a red card and the co-operation of both the player and the club throughout the process, mitigation of 50 per cent was applied. The player will therefore be available to return for the Champions Cup clash against Racing 92 in Belfast on January 13. 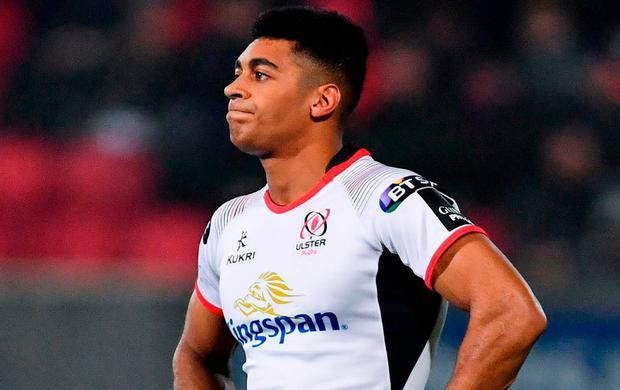 Should Ulster winger Robert Baloucoune have been red-carded after just 11 seconds against Munster?